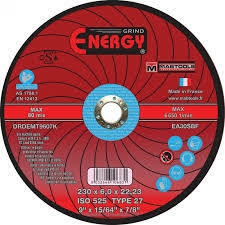 The main feature of Energy Grin discs is the good removal of imperfections on the surface. This allows better results for the most common gripping operations even on large surfaces. Main applications: maintenance, metalworking, metal constructions, garages, rails, tanks, shipyards, gas and oil pipelines, general use of metals. Main features: flexibility, high level of storage, convenience in use. Energy Discs are designed and manufactured to provide the best performance for work on steel, stainless steel, cast iron and stone. The disks are produced with high quality European raw materials, corundum and silicon carbide, mixed with resin bonds and special fillers. Reinforced fiberglass meshes are chosen for their quality and strength, resulting in maximum security when using the disc.